In the early days of money, gold coins were used to pay for goods. The money had intrinsic value. Cut a gold coin in half and you had two pieces half its value. With a rise in the volume of goods and services produced there was a need for notes and coins. The gold standard was a way to fix the value of money by allowing them to be converted into a certain amount of gold. This gave people faith in the new 'paper money'. For example, in 1717, United Kingdom fixed £1 to 113 grains (7.32 g) of fine gold. Throughout the nineteenth and early twentieth century, other countries also adopted the gold standard. They set their currency at a certain level against gold. 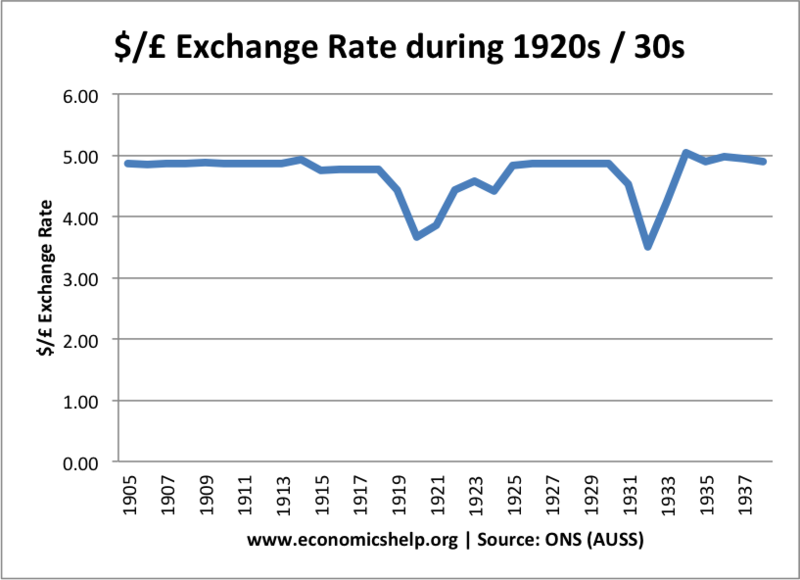 Exchange rates were very stable and only moved after an agreed adjustment. American Express could print travellers' cheques and say exactly how much foreign currency it would buy. The advantage of the gold standard is that the amount of gold was relatively stable. It means that governments couldn't print money and create inflation. It also created confidence in the financial system. The gold standard also creates stability in exchange rates. This creates greater certainty for international trade. Also, exporters know they can't rely on devaluation to improve competitiveness, encouraging firms to cut costs and increase efficiency. 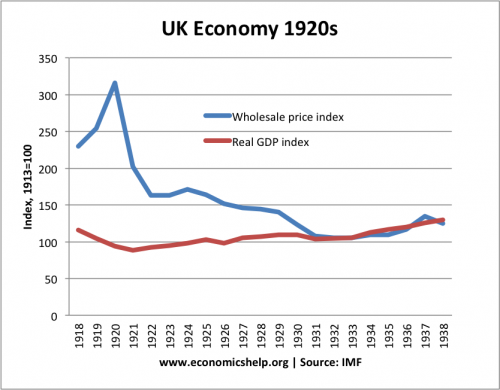 However, in the First world war, the costs of the war were so great countries abandoned the gold standard so they could print more money and pay for the war. This led to inflation which persisted after the war. After the first world war, countries returned to the gold standard. In the early 1920s. Defeated axis powers like Germany, Hungary and Austria couldn't pay their reparations (denominated in gold). Germany printed money causing the famous hyperinflation. On the other hand, the US dollar was undervalued, this contributed to a boom in US economy which led to the credit bubble and stock market crash of 1929. In the 1930s, the Great Depression caused many to leave the gold standards and allow their exchange rate to devalue. The UK left in 1931. After the second world war, Britain had depleted its gold reserves in paying for the war, a return to the gold standard was not practical. Note: 1925, rejoined gold standard at pre-war parity. 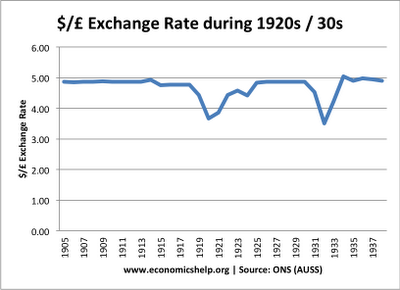 Left gold standard in 1931 and suffered sharp devaluation. 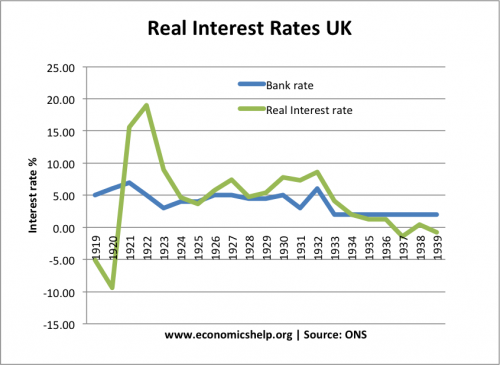 This shows the real interest rates necessary to keep the UK in the gold standard. It was only after 1931 that real interest rates fell. However, to guard against the inflationary potential of floating exchange rates and Central Banks with the power to print money, the Bretton Woods system was set up. This was a fixed exchange rate system where countries pegged their currency to the dollar and the US fixed the price of gold at $35. Bretton woods broke down in the 1970s. Some (Austrian economists) argue we should rejoin the gold standard to protect against inflation and the power of Central banks to inflate away debt which benefits governments and those with debts but destroys the income of savers. Inflation or deflation could be created by variations in production of gold. In recessions, monetary policy becomes ineffective because governments cannot increase the money supply. (1) Is there any way of setting up a Gold Standard which would avoid the past disadvantages you outline? (2) Given that logical deduction (as per the Austrian economists) must use some, albeit basic, empirical data - after all, "for every debit there is a credit" - can there ever be a rapprochment between this camp and the econometricians? causing the same inflationary conditions as if money had been printed. Nice essay. Something missing though…like a very MAJOR thing missing. Currency notes arose as receipts for gold, which is why they were based on gold in the first place. You hand in your gold, you get a receipt, which you can then use to trade instead of carrying your gold around. At any time, you can redeem your receipt for the gold, because it is a receipt, it is NOT MONEY. Whoever decided to allow these receipts to be unexchangeable for the gold they represent to the full amount is a thief. When currency became zero backed by gold the robbery became complete. A piece of paper in exchange for gold WAS NOT THE AGREEMENT. The agreement was to take a piece of paper as a RECEIPT for the gold STILL OWNED by the bearer of the gold. Not allowing the bearer to redeem his gold, means the bearer has been robbed, and given paper while the bank keeps the gold. It would be interesting to know the original legislation that allowed this to happen. In the UK that piece of legislation may be legal but it is unlawful, because it legalises stealing. HM government does not have the power to break Common Law as each Bill must be presented for ratification to the Monarch, who has sworn an oath to uphold the law of the land, which is COMMON LAW. (commit no harm or loss to others, and no fraud in business dealings. ).